Nuts and Bolts: Sort by Notes Uniqueness. We’ve shared before the importance of unique Artist’s Notes for each card. This field serves as a product description and should be different for each card. In general, it can be challenging to create unique and creative notes and quite honestly it can be downright mind numbing to do so for a like image series of cards. 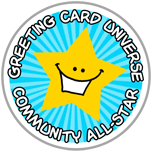 With our recent guest post, Storewide Facelift by GCU artist Doreen Erhardt which detailed her complete once over of each and every card in her store including fine-tuning the Artist’s Notes, Doreen shared with GCU that it was quite cumbersome to locate the cards rated Not Unique. We are happy to announce a new “Sort by” filter in artist’s Manage Cards page! It’s located in the left hand margin under Find Specific Cards as “By Uniqueness:”. This will allow you to sort for Very Unique, Unique, Not Unique cards. So easy now to quickly identify your cards with red or yellow thumbs and craft new descriptions to boost their exposure. Thank you, Doreen, for the excellent feedback! The uniqueness is literally the difference between your card getting exposure outside of GCU or not. Exposure means visibility and visibility means sales. If you’ve seen your sales drop since this was announced and have not made improvements to your Artist’s Notes this is probably the reason why. Note: another important item to include in your Artist’s Notes is an English translation for Non-English cards. ← Wanted New Cards: Persian New Year Relation Specific. Mindy, this is FABULOUS! Thank you, thank you, thank you! I was absolutely positive that I had touched every card and yet this sort just found 322 out of my 6000+ that were totally missed and are in desperate need of facelift and meta tag updates. WONDERFUL tool! Thanks for listening and please pass along my sincere gratitude to your brilliant GCU tech team for their quick response in coming to our rescue! Excellent! There were 45 public marketplace cards I had missed which have been improved upon now. So I can now say with 100% confidence that ALL my cards are good to go! THANK YOU, Mindy and team GCU! Thanks for your feedback and appreciation! We’ll see if programming can get the Status filter to work in conjunction with the Uniqueness filter. This sounds great!. After reading Doreen’s article when it first came out, I have been weeding through my cards and found more red dots than I thought were there. I’m trying to do a few at a time when I can. This filter will sure be helpful. Thank you Mindy and team! I appreciate it! BTW, my Chrome browser isn’t showing the “Inline image 4”, so I’m wondering what I’m missing! Hi, nothing missed. Just a green thumbs up! UPDATE: the Sort by Uniqueness filter has been updated to only look at cards in Approve status which are the only ones you should be concerned with.